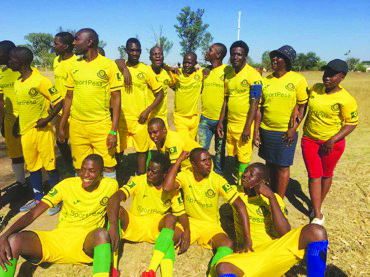 CHIKOMBA- Chivhu based forex dealers have put together their meagre resources and established a football team to provide entertainment and for socialisation during their spare time. Over 32 forex-dealers came together recently and formed Brunnaberg FC a social club which they intent to register with ZIFA very soon if funds permit said the chairman, Denis Phiri. The youthful club has both female and male members. “When the club was established, each member of the club contributed $5 towards the purchasing of the soccer kit and other house-keeping issues. However, none of us has a stable source of income hence it has been difficult to formally register our team,” he said. The team is currently using Liebenberg High School grounds for training sessions and other matches. Phiri said the club is seeking for sponsorship from well-wishers for affiliation fees to ZIFA so that they can formalise their sporting activities. Brunnaberg coach, Howard Bhasera said the team is raring to go as it has a blending of youth and veteran players who are ready to showcase their skills. “Our team is currently playing only home games against Chivhu ZRP FC, Nharira FC, and Applesun FC among others, but they are mere friendly matches. We are hoping to start playing away matches if funds permit,” said Bhasera.